Prominent & Leading Manufacturer from Nashik, we offer 90% w. g. micro granule. Thiogreen WG (micro granules) is 90% Sulfur, manufactured with very high-tech nanotechnology. Thiogreen contains highly pure active elemental Sulfur in superior water dispersible form in ultrafine particles in size which makes this product very popular for drip irrigation. After three primary nutrients Nitrogen, Phosphorous and Potassium, Sulfur is a forth important nutrient, hence Thiogreen is a Leader of crop nutrition programme. Benefits :-Thiogreen increases uptake of N, P K, Zn, Mn, B, Fe, Cu, Mo Thiogreen increases photosynthesis & energy transfer. Thiogreen plays important role in plant physiology – energy transfer metabolism. Thiogreen helps in Amino– acid synthesis, Carbohydrate synthesis, Lipid synthesis & Nitrogen assimilation, Phyto Pharmaceutics synthesis, DE toxicant synthesis etc. Thiogreen improves yield, quality, and shelf life and gives natural color and flower fruits, tuber, grains and cereals.Thiogreen also improves microflora of useful fungal and bacterial species. Thiogreen is recommended for all agricultural crops. Dose:- Doses vary with crop life, productive capacity & types like Carbohydrates, Proteins if oil seeds.Soil application / Fertigation :- 3 to 12 Kg/ acre Suitable for Basal dose also. 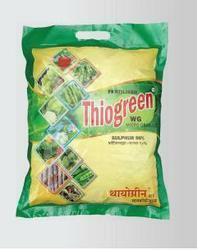 Compatibility :-Thiogreen can be used in any type of soil and with any other fertilizers. Looking for SULPHUR FERTILIZER ?